Usually, when buying a German Shepherd puppy, a person already knows if the puppy is to be a Schutzhund prospect. Let me note right away that if you don’t want to do Schutzhund with your puppy and want “just a pet,” there should NOT be a compromise in quality. Even as a pet, your German Shepherd should be intelligent, confident, loyal, protective of your family, and healthy, so make sure you get your German Shepherd puppy from a good quality breeding. A German Shepherd puppy that comes from lines with Schutzhund or other titles also comes from lines with healthy temperaments. Many people ask: can a German Shepherd trained in Schutzhund be a good family pet and protector? Absolutely. 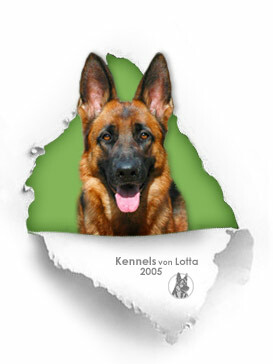 A good Schutzhund titled German Shepherd makes a confident, well-trained, and obedient family member. The key difference is not in the way the dog behaves as an adult, but in the way that you raise your German Shepherd puppy. 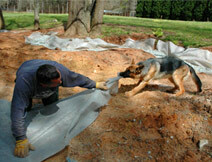 Raising a Schutzhund prospect may require a lot more patience and time investment on your part. There are certain things that you will have to put up with and certain things that you will have to teach your puppy early on. Some of the special aspects you will have to consider are more extensive socialization, demand for more patience with puppy’s antics, and encouragement of drive development. First and foremost your Schutzhund German Shepherd puppy will require very extensive socialization. Early socialization is important with any German Shepherd puppy, but a Schutzhund prospect will need to go through a much more extensive regimen. A Schutzhund German Shepherd puppy will need to learn to deal with stress and to conquer difficult situations with confidence and eagerness, rather than just giving up. 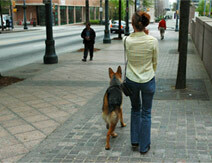 You should start with taking your German Shepherd puppy to public places where he can meet adults and children. Normally, puppies are happy to meet people, but sometimes a puppy may become very careful and suspicious about one particular person, for example a motionless person. If the puppy acts scared - talk to him in an excited voice and encourage him to go closer and investigate. Not every person loves puppies, so do not expect that your puppy will be welcomed every time, but you can still come close enough to a “scary” person so that your puppy can smell him or her and see that there is no danger. Never drag your German Shepherd puppy against his will if he is scared - he will panic. This applies to “scary” objects too. Sometimes puppies become suspicious of harmless objects such as a fire hydrant or a “For Sale” sign shaking in the wind. Let your puppy take his time and investigate the object. If necessary, come up close to the object while your puppy is watching you and touch the object while speaking to your puppy in an encouraging way. Eventually curiosity will win and your puppy will come closer to examine the object. Praise him excitedly! You will see that as soon the object is not “scary” anymore, your pup will totally loose interest in it. It is better to encourage your German Shepherd puppy to come to people, not vice versa. Ask your friend to sit down and clap his hands. Encourage your puppy to come up to your friend and ask your friend to give the puppy a treat and to pet him when he approaches. Your puppy should learn that people are harmless and it’s OK to go up to them. Another way you should socialize your German Shepherd puppy is to take him to places that are challenging for him. For example, turn off the path and walk into the high grass. Let your puppy follow you and conquer this difficult (for him) situation. Chose different types of such challenging places for your pup, such as a construction site, the children’s playground, a formation of rocks, etc. Make sure that the challenges are not too hard for your puppy’s age and ability. He should be able to overcome them and to learn that his efforts lead to success. If you choose obstacles too difficult, your puppy will feel helpless - not exactly what you need. There is another way to encourage curiosity in your German Shepherd puppy, and this is where the conflict between raising a Schutzhund prospect and a pet usually arises. When you do any kind of yard work, for example, your puppy naturally wants to accompany you and to “help.” Puppy’s help usually means being underfoot, stealing your work gloves, and digging out plants that you just planted. From his point of view you are hunting, and you are teaching him how to hunt. Your puppy will do his best to work with you as a “team,” after all, his pack instincts are so strong! His instincts tell him that in order to survive he needs to take part in everything that you do so that he can learn all of the wonderful skills that you have, without a doubt, as his pack leader. Now, what usually happens when puppy tries to learn and investigate the world (so what that it means stealing your seedlings)? He gets yelled at and chased away! Notice, that in your puppy’s mind he gets yelled at not for putting his nose in the exact spot that you want to hit with a hammer, but for being curious and active. This can be OK if you are raising a pet, but this is exactly what needs to be avoided if you are raising a Schutzhund prospect. The solution is to let your puppy “help” you for as long as you can keep your sanity, and then, when you are turning red from anger and frustration - it is time to put your German Shepherd puppy away - calmly and with dignity. This applies to all family members. You should let them know about this concept and try to engage them in a training process of PATIENCE. Another essential aspect that may require you to exercise your patience is obedience training. When raising a Schutzhund prospect, YOU NEED TO WAIT! I bet your German Shepherd puppy is very smart, and it is tempting to start teaching him all kinds of tricks, but you should be very careful. There should be no compulsion training in sight until your German Shepherd puppy matures enough to withstand it without loosing his confidence and independence. If you cannot wait - teach your puppy “Sit,” “Down,” and “Come,” but with positive training methods only. Early compulsion training or corrections may ruin your puppy’s confidence once and for all. Some German Shepherd puppies are harder than others, but it is better to be safe than sorry. Now let’s talk about drives. Not every German Shepherd is born with the set of drives necessary to do well in Schutzhund, but most likely, if you get a puppy from proven bloodlines, he has those inherited drives. However, if German Shepherd puppy doesn’t get to use and develop them in the early months of his life, they may “fade” away, and it may be very difficult or even impossible to bring them back. It’s the same as with humans. All human babies are born very flexible. If you encourage the baby to use this flexibility as it grows, and train him/her, the baby may grow to be a professional gymnast. If you don’t, the baby will grow into an adult who has difficulty bending over to tie their shoelaces. This is why you should not lose the moment: you should play catch and tug-of-war with your pup to encourage drive development. Not only will this develop his drives, but this will also make sure that your puppy’s drives are directed to appropriate objects such as the rag and ball, and not to the garden hose or cat. When playing tug-of-war, remember that your puppy must ALWAYS win. Now, don’t let him win because he is exhausted and gives up - it should never get to that point. Instead, play for a few minutes at a time, let your puppy win, and leave your puppy wanting more of this game and looking forward to the next time. When developing ball drive - try a two-ball game. Here is how: get two rubber balls-on-a-string. 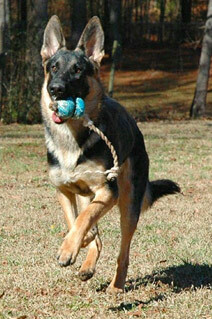 Attract the attention of your German Shepherd puppy with one ball and throw it (not too far at first). When your puppy runs to get the ball - get the second ball ready. When the first ball is in your puppy’s mouth, clap your hands and call your pup. When he gets closer, show him the second ball (swing it for more dramatic effect). Hopefully it will cause your puppy to drop the first ball. As soon as he does, throw the second ball in the opposite direction from where the first was thrown. When puppy runs after the second ball, you quickly pick up the first one and repeat everything. Be careful not to overexercise your pup. This game may require considerable space.